With so many people getting into drones lately, it can be really difficult to sort through all your options and find the best affordable drones with camera. This list was designed to help you sort through all the competition and get only the best drones for sale. We’ve even put together some bits of information to get you started looking for all the things you really need in your drone. Check out our info boxes to learn more about the things you should be looking for in a drone. WiFi: Wifi on a drone means that your drone sets up its own network that allows it to communicate with your phone or mobile device. This can be integral if you want to see what your drone sees in real time, or if you want to use your phone as the controller for your drone. Headless Mode: Headless mode helps eliminate one of the biggest problems with new drone pilots- determining where the front of the drone is while in the air. 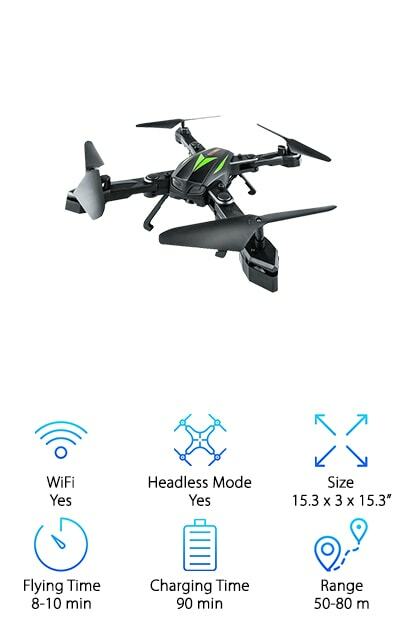 Headless mode makes it so that whatever way the drone is facing, that is the front. This makes it easier and safer to fly the drone. Size: How big your drone is can correspond to how easy it is to control and transport. If you’re planning on taking your drone all around town, consider something compact. If you are a beginner, a compact drone may be easier to fly as well. Flying Time: Everyone wants to fly their drone for hours on end, but many drones only come with a few minutes of flight time, as it takes a lot of power to fly a drone. Look for a good balance of flight time and charging time to truly have the most fun with your drone. Charging Time: The charging time is also an important factor to consider when looking at drones. If your drone takes a long time to charge, you won’t always get the most out of your time. Keep in mind that most drone batteries take at least an hour to fully charge. Range: This info box tells you how far you can fly your drone. If you are just planning to fly around your backyard, a shorter range will be great. If you want to really let it out in the open, you may want to consider getting a drone with a long range. Now that you know what to look for in low cost drones, let’s get right to the list. If you’re in a hurry or looking for the best of the best, check out our top and budget picks. They’re what we consider to be amazing drones that are incredibly high quality without the high price tag. If you want to be sure you’re getting the best drone for you, be sure to read through our other eight picks. They’re all amazing choices for anyone looking for a great drone with a camera. Happy flying! Our top pick is the best budget camera drone around and is sure to wow with a 720p HD camera and 6 axis gyro technology. It comes with headless security, which makes it easy for beginners to learn without destroying their drone. It also has one key return, which allows you to easily and quickly call the drone home when you’re finished flying. It even comes with an altitude hold function, which can be incredibly useful for getting a great view of one particular spot. As one of the best low cost drones with camera, the Holy Stone F181C Quadcopter Drone is an easy top pick. It comes with two batteries so you can keep flying for longer. This drone flips four ways, so it’s great at doing tricks once you get the hang of flying it. It is easy to safely land, with one key engine start and stop. This is a great pick for pros and beginners who are looking for a fun drone that won’t break the bank. Our budget pick is the best budget drone you’ll find. 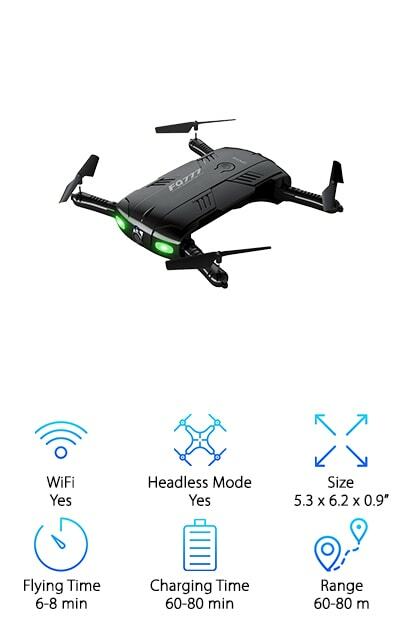 It comes with headless mode to ensure you won’t get lost while steering your new drone. It is Equipped with the latest 6-axis flight control systems and 3D lock to allows you to have a more controlled flight. It also gives you more force when operating your drone. This drone is equipped with an HD camera that can take photos and videos while flying. This brings A New Perspective to your photos and allows you to see the world from the air. This drone can perform 360-degree rolls which gives you continuous action and great performance. The wifi feature allows you to view photos and videos from your phone while the drone is in the air, making it a standout among smartphone drones. This drone comes with a 500 mah battery which gives you a long flying time of 5 to 7 minutes. It has RC controls from up to 50 m away. If you’re looking for the best cheap quadcopter, the DBPOWER MJX X400W FPV Drone may be exactly what you’re looking for. This quadcopter allows for real-time transmission to your smartphone. It is armed with a WiFi HD camera that allows you to view the world as your drone does. You can even take photos and videos straight from your phone and share them to your favorite social network in real time. 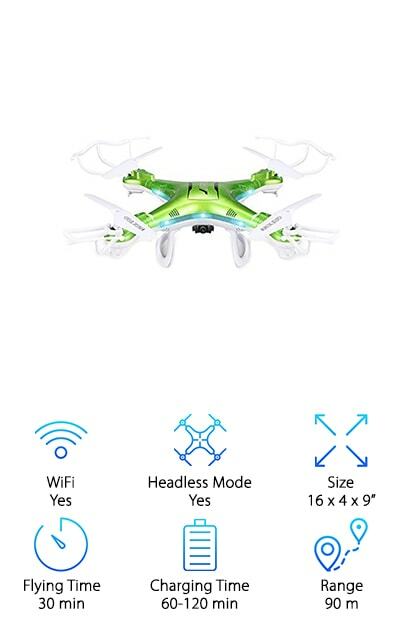 It also comes with a headless drone mode for beginners and kids that allows you to more easily control your drown. When it is in headless mode it has a one key return feature that allows the drone to return automatically. They can also perform 360° flips in all directions making it a perfect drone for any show-off. It comes with two speeds and is easily switchable between the two. This is a great feature not available in many inexpensive drones. 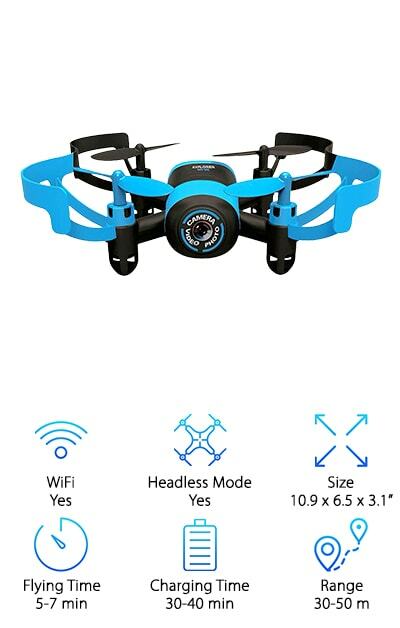 Another great cheap drone with camera, this awesome quadcopter by QCopter is sure to be a great time. If you're a beginner this is a perfect choice as it comes with a bonus battery and crash kit. This includes replacement drone gear parts, mounts, and shafts, as well as snap-on motors and propellers. This drone allows for an incredibly long flight time and provides up to a 30-minute drone experience. This makes it perfect for those on the hunt for cheap drones with long flight time. The Wi-Fi + HD camera feature allows you to take photos and videos from your smartphone. this allows you to document your drone photos and video and easily post them to share with your friends. This drone is easy to fly making it perfect for kids, beginners, and drone enthusiasts. The stable drone design with colorful LED lights makes it fun and exciting to fly. Another great budget camera drone, this Hasakee Mini RC Helicopter Drone is perfect for kids who are just learning about drones. The supermini design makes it a perfect gift for kids of all ages. This makes it easier to fly and harder to break. It comes with a camera that allows you to capture photos and videos as well as enjoying live video feed of your flight from your mobile device. The headless mode makes flying easier for beginners, making this a perfect drone for anyone who's just getting started. 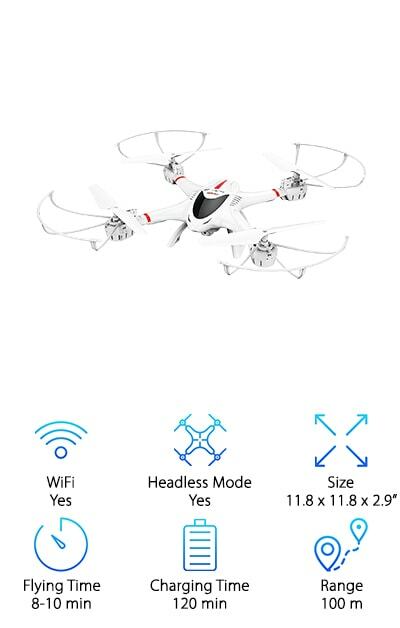 Headless mode is something that is available on many cheap but good drones. It comes with both high and low speeds so the drone can grow with the learner. Low speed is perfect for beginners who are just getting started and high-speed is perfect for those who’ve mastered the basics and are looking to have a little fun. This drone even comes with built-in altitude hold which makes it easy to control and fun to play with for any level. For those looking for an affordable drone with camera it still looks modern and sleek, this is the one for you. This drone comes in a sleek matte black and is built with a sturdy construction. It even comes with a controller to allow you to easily control your drone without your smartphone. If you'd like to use the camera to view the world the way your drone does you can always mount your phone on top of the controller. This gives you full access to your drones features and allows you to get the most out of your flight. This drone comes with an HD camera that allows you to see the world clearly and take great photos and videos. It comes with both headless mode and an altitude hold function. 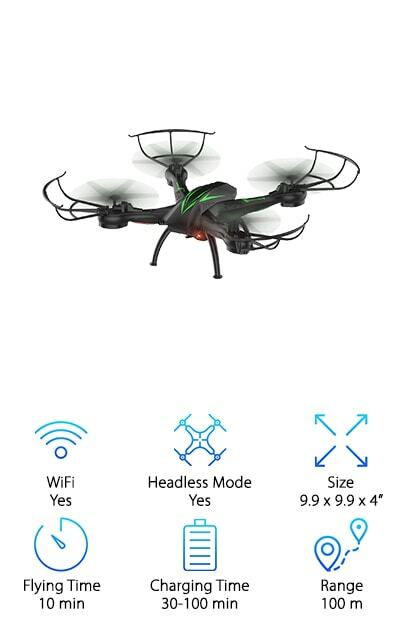 It also comes with bright LED lights that allow you to keep track of your drone even in the dark, making it solid competition for the best cheap drone on our list. A true legend among cheap fast drones, AKASO offers an amazing drone without the hefty price tag. It even comes with a foldable quadcopter design. This helps you keep your drone protected while in transit and makes it easy to take it with you anywhere. This drone comes with the one key return feature that allows you to call your drone back with the press of 1 button. It also comes with a 720P HD camera. This allows you to record high-quality video or take clear photos from the air. 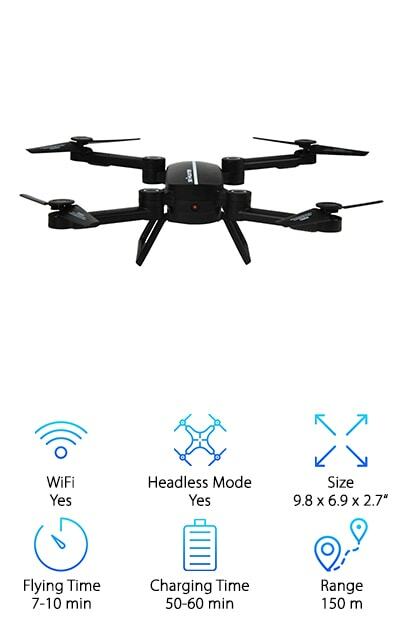 It also has a powerful air pressure altitude hold function that allows you to keep your drone hovering at a certain height, a great feature in cheap drones. This can be useful for beginners learning how to fly drones or for just taking a picture of yourself from the air. It also has 6-axis gyro flying control that offers strong stability. You can get it to do many different tricks by changing the directions- up/down, left/right, and even 360-degree rolls. When looking at cheap drones for sale, it’s hard to find something that ticks all the boxes. This sleek looking, foldable drone does just that. 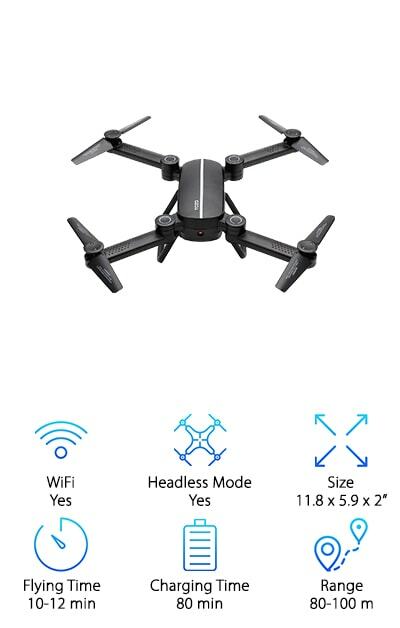 It is a true powerhouse among budget drones. It comes with WiFi app control and a remote control function. This works with your smartphone and allows you to control your drone as well as take photos and videos. It also comes with a remote control in case you don't want to use your phone. The aerial camera provides real-time image and video transmission which allows you to take stunning videos and pictures with its HD camera. 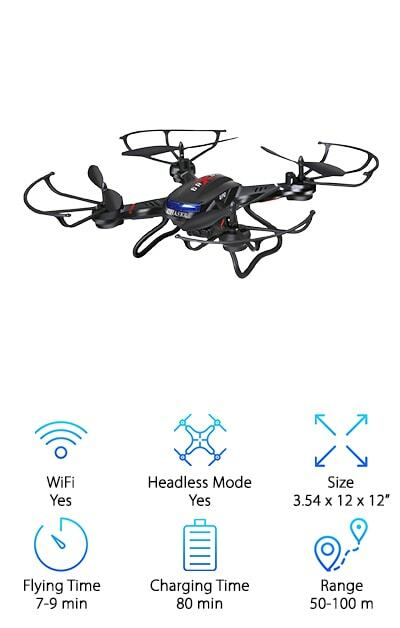 This drone comes with an advanced barometer which allows it to have a more powerful air pressure altitude hold function. This ensures stable quality images and videos. It also comes with headless mode and one key return. For more advanced flyers it has the ability to do 360-degree rolls and other tricks. On the hunt for something truly special in the world of cheap drones with camera? This easy to use and portable quadcopter is the perfect starter drone for any beginner. It includes everything a beginner needs to get started flying drones. The remote controls have notes printed which makes it incredibly easy to learn what all of the different functions do. 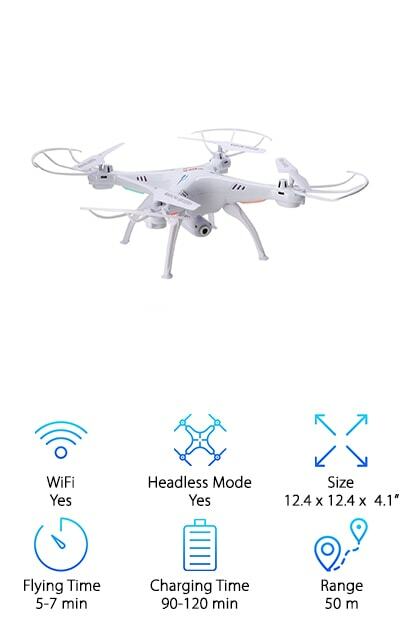 It also comes with headless mode which optimizes proper functionality even when you can't see your drone. It even includes a one key return home function which means the press of 1 button brings the drone back to you. It also includes a powerful air pressure hold function that allows you to release the throttle and enables the drone to hover while maintaining its height. Its compact design packs easily into the compact craft box that comes with the drone. This makes it easy to carry and transport from place to place. This drone really stands out style-wise from other good cheap drones. It has striking green streaks on top that give it the look and feel of an alien insect. This drone also comes with a controller, which can sometimes be rare in affordable drones. It is made of strong ABS material. ABS material is light, flexible, bendable, and soft. This makes it a really durable drone which is perfect for beginners and crash-prone pilots. It comes with real-time transmission via its wifi network. This allows it to connect directly to your phone so you can view everything your drones camera sees in real time. It has a headless mode which allows it to be operated easily regardless of which direction it is facing. It also has gravity induction which allows you to fly your drone forward, backward, left, and right in correspondence to the angle at which you hold your mobile device.